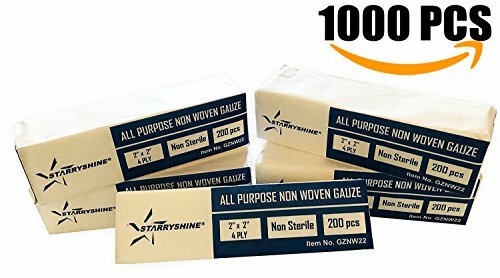 2''X2'' Non-Woven 4-Ply Dental Medical Gauze Pad, Non-Sterile All Purpose Gauze Sponges, 4-Ply Cotton Filled Sponges Provide Maximum Absorption 1000 PCS (5 BX) by Starryshine at In The National Interest. MPN: GZNW22X5. Hurry! Limited time offer. Offer valid only while supplies last. Non-woven gauze are manufactured from non-sterile (polypropylene) material. Nonwoven gauze swabs are virtually lint-free and do not stick to wounds. Non-woven gauze are manufactured from non-sterile (polypropylene) material. Nonwoven gauze swabs are virtually lint-free and do not stick to wounds. 4-ply for extra absorbency. Our gauze swabs are wrapped into smaller packages within each case for convenience. If you have any questions about this product by Starryshine, contact us by completing and submitting the form below. If you are looking for a specif part number, please include it with your message.